The relationship between a Father and Daughter is a special one. This event honors that relationship and allows you to celebrate it with your daughter in the Historic surroundings of Teutonia. The event will start at 2:30 with a flower and a photo for the daughter. Alcoholic beverages, soft drinks and snacks can be purchased. There will be light musical entertainment appropriate to honoring our daughters, including a demonstration dance by our Alpen Schuhplatteers. 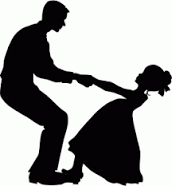 Dancing will follow to the Music of Bill and Tanya Dorfner. It is a celebration of the wonder of daughters and we invite Fathers and Grandfathers, to bring their daughters and granddaughters of any age, older Brothers to bring their sister (in honor of their father) and Fathers to bring their Daughter-in-Law. Guest fathers and daughters are invited, with a member. The adult menu is $22 for schnitzel and $25 for filet and crab. Kids can order either chicken fingers and French Fries or a Hotdog and Mac and cheese for $14 - all meals are plus tax and tip. This includes the photos and entertainment. This event is always a great success and we urge you to save the date and make reservations early! Formal or Traditional Dress will be observed for the event.